Forum Home > eBay, LeBonCoin, Mercado Libre, Yahoo Japan, etc. > THE CRAZIEST eBay / Yahoo Japan 7Axx prices to date ? Over the last 3 years, I've noticed a gradual climb in Seiko 7A38 prices on eBay, as more and more watch collectors come to appreciate them for what they are. I've also seen some borderline ridiculous over-ambitious (obviously often speculative) asking prices for 'Buy-it-Now's - but these four listings have got to take the biscuit. I watch 7Axx watches on the bay. Today, two 7A38s came up, Guigiaros, NWT from a zero-feedback seller. BIN on each is $2350. 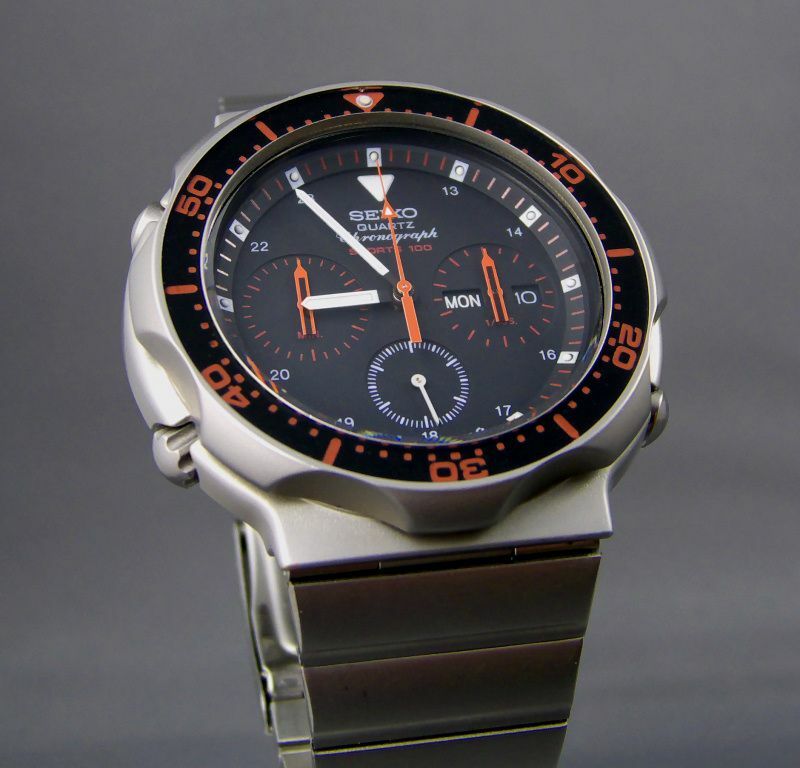 VINTAGE SEIKO CHRONOGRAPH CALIBER 7A38 - 704A "BY GIUGIARO"
VINTAGE SEIKO CHRONOGRAPH SPORT'S 100 CALIBER 7A38 - 7140 "BY GIUGIARO"
All from the same new ZERO-FEEDBACK seller. Yes, I spotted them, very nice clean examples. 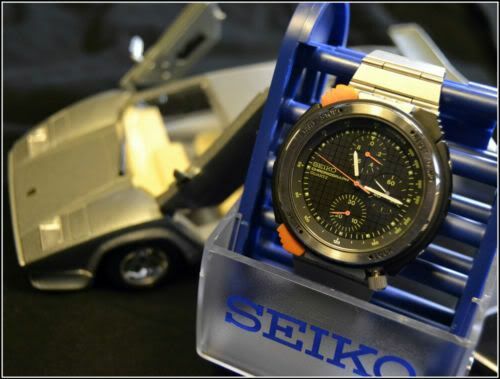 Can only be a good thing, as this will push value of 7A SEIKO's up. If i were a millionaire, i would buy them all! Question is though, do the model cars come with them? These stupid asking prices will do nothing to push 7Axx prices up - it's the prices they ultimately sell for that set a benchmark. There will always be a demand from collectors for NOS or very lightly worn examples (as you found out to your cost this morning - sorry), but it is the collectors who ultimately decide what they are prepared to pay. Sooner or later this newbie Italian seller will gauge the market properly, and succumb to accepting (much) lower offers - or possibly withdraw them from sale. Speaking of which, I'll admit that I offered him $235 (his asking price with a 0 missing off the end) on both the 7A38s. Purely tongue in cheek - expecting my offers to be declined - which they were. The next day, I noticed someone else had made offers on them and also been declined. I recognized the abbreviation for his eBay user ID (he's another serious collector), and as we'd been exchanging emails, I asked him if he'd mind telling me what had offered - he wrote back $325 - not an unreasonable offer. I bet you, in a month's time, when they're all still unsold, if someone were to offer the seller the same numbers, but re-arranged slightly - $532 - he'll jump at their offer. He'd be a fool not to accept. Nuff said. Let's see what happens in 23 days time. As for the model cars, I suspect they're only something like cheap Italian 1:43 scale (Bang or Bburago) diecasts. Look at the thickness of the opening doors on the Lamborghini Countach. 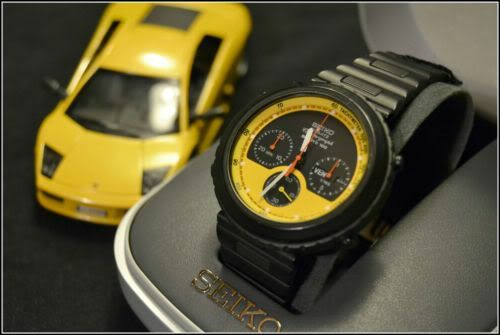 One day I'll take some photos of my watches with some of my hand-built 1:43 model Ferraris. But that would be going 'Off Topic', wouldn't it ? 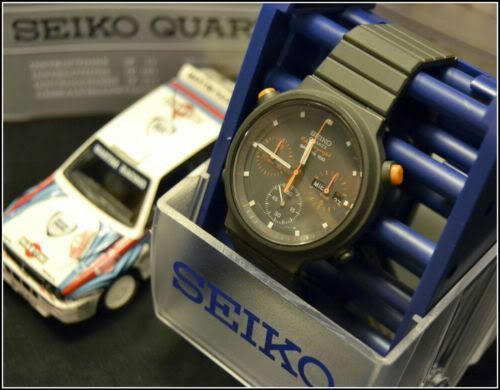 Awesome watch, awesome price too.. Yes, I was watching that as well but figured there was bound to be some serious interest so didn't bother to bid. I'd absolutely love one of those 7A38-6020s but it was getting away from me even before the 'end-game'! Seriously surprised that it went that high even allowing for scarcity and quality. Would have been impressed if it had got to £400 let alone £550. If it's any consolation, James - it was getting away from me too, or well above the figure I'd intended to bid, before 'the end-game'. Interesting that it was won by a zero-feedback bidder who appears to have created the ID specifically for bidding on that item. Makes you wonder if it was some kind of scam, and whether he will actually pay up - I suspect we'll possibly never know. Incidentally, the one which Derek sold on eBay in June 2009 (which appears to have been in better condition) went for £342. Thought you might have been interested, Simon. These things can become quite addictive. Posted on WUS, at the end of last year by another of our forum members. That is a seriously nice looking watch. I would love to see the range of 7A38's out there - then again, I think it could be a 'bad' thing as I would be bound to spot many that I would set my heart on. I just had my bid cancelled on a US watch due to the auction being ended early. I would appreciate it very much.Thanks again. I gave him the serial number and made reference to the eBay auction we are discussing - BTW it has a different serial number. Maybe it was him - using a new eBay ID, perhaps. Apparently it was a genuine bid, and the buyer (from UK) has already paid. Guess I'll have to stick with my somewhat cheaper 'beater' example for a while longer. Rather than some crazy guys out there asking equally crazy prices for some models (they are always out there, either for a 6138 or an Omega), what i believe is worth noticing is that even the more regular models or once truly "cheap" ones, have been consistently going up. I have been watching more than a few lately, in order to find a donor my watchmaker asked me to get for him, and even those golden tones ones nobody cared about only some months ago, tend to end with bids over 60 or 70 Euros plus shipping on ebay. Furthermore those aforementioned crazy guys would have been asking crazy prices for Aliens and Giugiaros basically. I have seen pretty high prices on 7A28-7039s or 7040s that I used to consider low to mid-priced 7As (ranging 120-180 usd?) not so long ago. Maybe I should look somewhere else than the bay, but it is my impression prices have been going up for these watches in general, especially during the past six months or so. 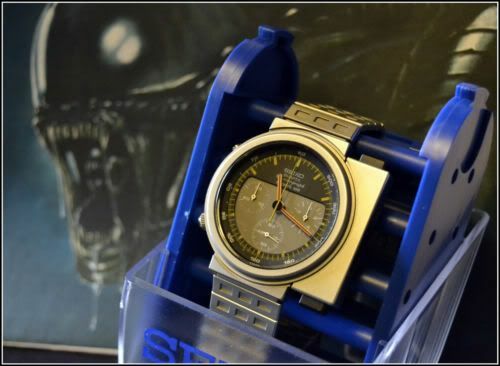 I have not been into forums enough, but i have a vibe that watch forums and watch collectors (nothing but justice) have created a buzz and a hunger for them. As i say, 7As are quartz watches that even those anti-quartz like: they are highly collectible, they have history (from military use to cinema) they are superbly built and they offer such a variety it is almost impossible not to find one that you would like. Saludos! An offering from someone notorious in the world of LCD watches, Goffre 78 AKA Alberto. Supposedly an agent for someone else, a purchase from him will garnish many sales emails and he's known for an aggressive manner. Largely reviled on the 'nerdwatch' boards for excessive trolling and using forums as a place to advertise whilst offering nothing constructive, he is renowned for ridiculous pricing (seems common in Italy! ); as seen here. The plus side? A lot of the watches he sells are rare and in excellent condition and he is reliable. THAT is truly ridiculous James. $950 for a 'NOS' two-tone 7A38-7270 !!!! Hang on - I got the wrong smiley. Edit: Did you notice he got the model number wrong in both his listing title AND description - 7A38-7020. Posts: 34 He is a crazy and deluded italian seller. I'd not noticed; I defer to those with greater individual coding knowledge! I had figured that anything 'two-tone' would not be figuring too high on anyone's must have list... Certainly not £600 worth of two tone anyway! Yes. I'd seen that 7T59-6A00. Now THAT is seriously tempting at the same price. In case anybody was wondering where they were coming from .... I've 'borrowed' a few of the more common smileys from RLT. Currently they're just sat in my PB account - until I can figure an easy way of porting them to the forum, for everyone else to use. He is a crazy and deluded italian seller. I have it on good authority that the seller has already declined 2 offers for the 7A38 - the higher of which was a generous $250. Indeed, truly a deluded man.